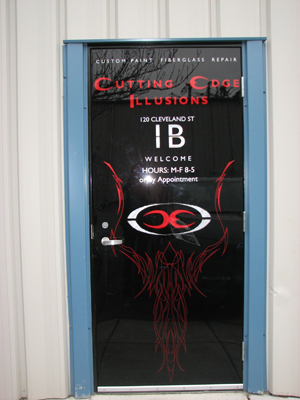 At Cutting Edge Illusions we have built our facilites to support the repair and painting of vehicles and toys of all shapes and sizes. With over 17,000 square feet of space in the Phoenix Industrial Park in Eugene, OR, we can support vehicles from as small as bicycles and helmets, to as large as Prevost buses and eighteen wheel fleets. All of our work is completed within our facility and never outdoors. 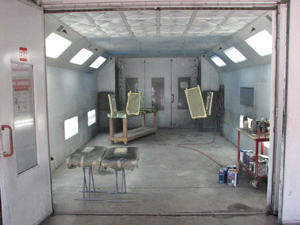 We have a total of four booths: one large, one automotive, one infrared dryer, and one for fiberglass fabrication. 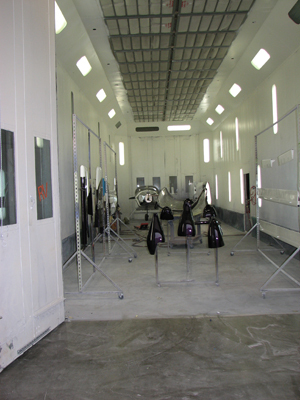 We also have a 22x8x8 powder coat oven, pretreatment wash statation and a 60x16x16 media blasting booth. We are located in a secure lot with automatic gates that are secured at night and on the weekends. Our lot has ample room and access for the largest of vehicles and trailers. Our fifty-six foot side down draft booth is sixteen feet tall and sixteen wide. This unit includes two make-up air units with one million BTU of heat capcity each circulating a total of fifty-six thousand cfm of air at optimum application temperatures. 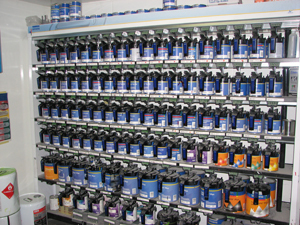 This booth is large enough to support and entire plane, bus, or big rig as well as large batches of smaller items. Our fifty-five foot cross flow booth also supports additional large fleet, trailers, and recreational vehicles as well as over flow space for large batch and smaller items. 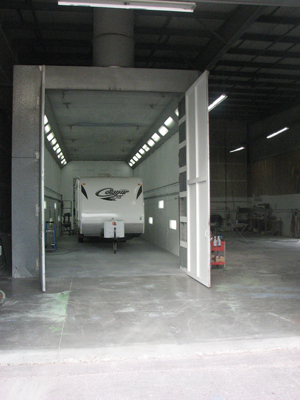 Our sixty foot cross flow booth is the third coach booth and is primarily used for fleet and recreational vehicle repairs and repaints. It is equipped with pneumatic lifts that allow our painters to move the length of the unit while elevated to efficiently apply material to tall units. Our semi down draft, twenty-four foot booth has a one million BTU make-up air unit for temperature control. 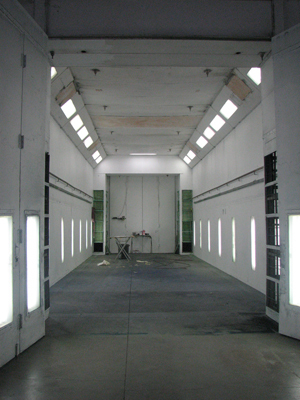 This booth is perfect for smaller projects including cars and light duty trucks, accessories and powersports. 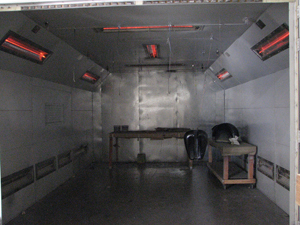 Our twenty-four foot infrared drying booth enables faster and harder curing of finishes. Our full mixing bank, mixing computer, and color camera allow us to mix both custom colors and stock OEM colors in exactly the quantity needed for the project.